Nigiri are an essential part of any great sushi meal. Each egg nigiri is worth 1 point. Each salmon nigiri is worth 2. Each squid nigiri is worth 3. An egg nigiri on a wasabi card is worth 3. A salmon nigiri on a wasabi is worth 6. A squid nigiri on a wasabi is worth 9. Small and tasty, can you eat more maki than anyone else? End of the round: Compare how many maki roll icons you have at the top of your played maki roll cards. Whoever has the most scores 6 points. Whoever has second most scores 3. If multiple players tie for most or second most, all players receive the full points. A player must have at least 1 maki roll card to receive any points for maki rolls. Example: Chris and Meredith have 5 maki roll icons, Kerry has 3 and Andrew has 1. Chris and Meredith each score 6 points and Kerry scores 3. In a 6-8 player game: The player with the second most maki rolls scores 4 points, and the player with the third most scores 2. Tied players all score the full points as above. You don't want to miss out on temaki - a roll that's big enough to fit in your hand! End of the round: Compare how many temaki roll cards you have. The player with the most scores 4 points. The player with the fewest (including 0) loses 4 points. If multiple players tie for most/fewest, all players receive or lose the full points. In a 2 player game: The player with the fewest temaki does not lose any points. Example: Chris has 3 temaki cards, Meredith has 2, and Kerry and Andrew have 0. Chris scores 4 points. Kerry and Andrew both lose 4 points. Uramaki rolls are inside-out. Race your friends to eat ten of them! During a round: If you are the first to have at least 10 icons at the top of your played uramaki cards, you immediately score 8 points. Move your pawn on the score track and then immediately discard your uramaki cards. The next player to collect 10 uramaki icons scores 5 points, and the third player scores 2. Again, these points are scored immediately and the cards are discarded. If multiple players reach 10 or more icons on the same turn, ties are broken by the highest total number of uramaki icons on the tied players' cards. If players are still tied, they both receive the full points for the place they are contesting. If this happens, the next place is skipped in scoring. End of the round: The player with the most uramaki icons still in front of them scores points for the next unclaimed place (8 points if no one has scored uramaki in the round, 5 if only first place has scored, 2 if both first and second place has scored, 0 if all three places scored). If multiple players tie for the most, they each receive the full amount. It's possible that one player may be awarded multiple placings for uramaki in a single round. Example: Chris and Meredith play uramaki cards on the same turn, and now both have 12 uramaki icons. They are the first players to pass 10 icons and so both immediately score 8 points. Second place will now not be awarded, so the next player to pass 10 icons will only receive 2 points. The round ends and no one else has reached 10 icons. Out of the players left with uramaki cards, Kerry has the most icons, so she scores the 2 points. Tip: Place discarded uramaki cards in a face-up pile beside the score board after scoring them as a reminder of how many places have been awarded in the round. They are of course shuffled back into the deck for the next round. (only use in 3-8 player games). These beans are the perfect snack to share at the table! Score 1 point per opponent with any edamame for each of your played edamame cards. Edamame are worth 0 if only 1 player plays any edamame in the round. Even if more than 4 opponents play edamame, the maximum each edamame card can be worth is 4 points. Example: At the end of the round, Chris has 3 edamame, Kerry has 2 edamame and Andrew has 1. Each of Chris's edamame is therefore worth 2 points (1 per opponent with any edamame) for a total of 6. Kerry scores 4 points and Andrew scores 2 points. You might not enjoy your first taste of eel, but it sure grows on you! If you have 1 eel, you lose 3 points. If you have 2 or more eel, you score 7 points. Example: Chris has 1 circle onigiri, 1 triangle onigiri and 2 square onigiri. He scores 9 for his set of 3 unique onigiri, and 1 for his second set of just 1 unique onigiri (the second square), for a total of 10 points. Everyone's always jealous of that one person who orders a hot cup of miso soup! If you play a miso soup card and it is the only one played in the turn, it remains in your play area until the end of the round when it will score 3 points. However, if more than 1 miso soup is played on the same turn (including by you), then all these miso soup cards are immediately discarded and will not score at the end of the round. Place them face-up beside the game board, to be shuffled back into the deck for the next round. If a player plays a miso soup by using chopsticks, spoon, menu, or special order it counts as being played on that same turn. You may score multiple miso soups in a round. A true delicacy, sashimi takes time to fully appreciate. If you have 1 or 2 sashimi, you score 0. If you have 3 sashimi, you score 10. You may score multiple sets of sashimi in a round. A deep-fried delight - you can't eat just one piece of tempura. If you have 1 tempura, you score 0. If you have 2 tempura, you score 5. You may score multiple sets of tempura in a round. Tofu is really good for you, but eat too much and you could get sick of it. If you have 1 tofu, you score 2 points. If you have 2 tofu, you score 6 points. If you 3 or more tofu, all are worth 0 points. Use chopsticks to grab those two dishes you really need at the same time. Chopsticks let you take 2 cards on a future turn. Nothing happens on the turn when you initially play chopsticks. However, you may use it on a future turn to take a bonus action. When you want to use it, call out "chopsticks!" as all players are turning over their played cards. Then choose a second card from your current hand to play this turn, and play it immediately. Place the chopsticks card back into your hand before it is passed on. This way, other players may choose to play the chopsticks card later in the round. An unused chopsticks card is worth 0 points at the end of a round. (only use in 2-6 player games). Not happy with the dishes on the table? Order something else off the menu! If you play a menu card, draw 4 cards from the unused deck near the board and look at them. Then choose any 1 card to play immediately (except another menu card). Return the remaining 3 cards to the deck and shuffle it. Discard the menu card face-up beside the board. (It will be shuffled back into the deck for the next round). Soy sauce makes every dish taste better. It's the perfect addition to a varied meal. At the end of a round in which soy sauce is played, all players compare how many different colored backgrounds they have among the cards they have played. If a player has the most (or tied for the most) different colors and has also played a soy sauce card, it is worth 4 points. You may score multiple soy sauce cards in a round. A soy sauce card itself is considered when determining the most different colors. Only dessert cards played in the current round are counted. (only use in 3-8 player games) Grab that dish you missed out on earlier by reaching over and taking it with your spoon. A spoon card allows you to take a card from another player's hand. Nothing happens on the turn when you initially play a spoon. However, you may use it on a future turn to take a bonus action. When you want to use it, call out "spoon!" as all players are revealing their played cards. All players play their chosen cards as normal. Then announce the name of any card you would like. The first player to your left checks to see if he has this card in his current hand. If not, the second player to your left checks her current hand, and so on until a player announces they have the card. This card is then given to you, and you play it immediately. Give your spoon card to the player you took it from, to place in their hand. If no opponent has the announced card in their hand, then the spoon is discarded for the round. Place it face-up beside the game board, to be shuffled back into the deck for the next round. An unused spoon card at the end of the round is worth 0 points. Note: When you ask for a type of card that has variations (nigiri, maki rolls, etc), you may ask for the card type in general, or one of the specific variations. If you ask for a specific card, the other players need to give it to you only if they have the exact card in their current hand. If you ask for the general card type, the player may choose between the different variations if they have more than one. 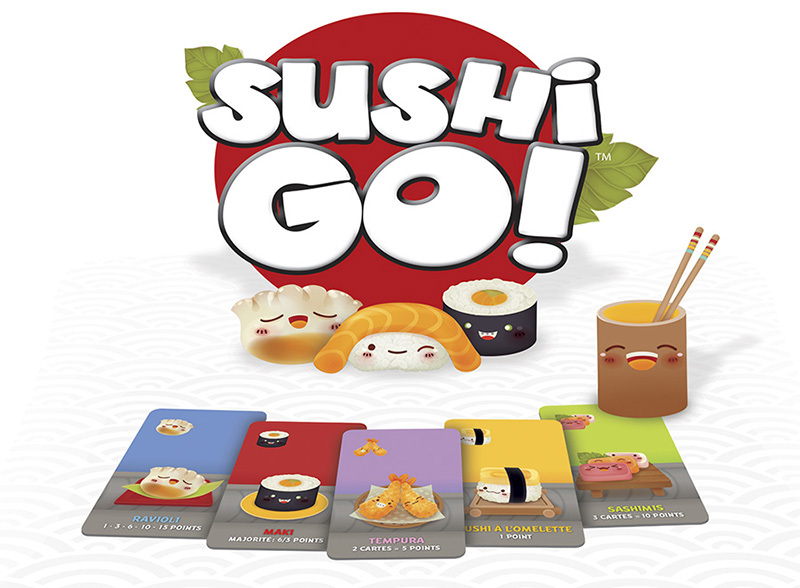 For example, if you ask for just "nigiri" and the player has a squid and an egg nigiri in his hand, he chooses which one to give. The same is true for asking for "3 maki rolls" or just "maki rolls", etc. (only use in 2-6 player games) Enjoyed a dish you've already eaten and want more of it? Ask the chef for a special order! A special order card copies any other card you previously played in the current round. When you choose to play special order from your hand, place it face-down on the table and point the top of the card at the card you wish to copy. Then, when the special order is revealed, place it on top of that card to show that the special order card is copying it. The special order card will score as if it is the card it is copying. If you have not played any other cards when you play special order then there is nothing for special order to copy so it is immediately discarded. (It will be shuffled back into the deck for the next round). If special order is used to copy a card with multiple icons on it, then the copy is considered to be the same card with all of the same icons. Not feeling like eating one of your dishes now? Save it for later and score more points. When played, you may immediately choose any number of the cards you played on previous turns this round and flip them face-down. These cards are now no longer considered to be the card depicted on their front. Instead, each are worth 2 points at the end of the round. Discard the takeout box card face-up beside the game board. (It will be shuffled back into the deck for the next round). Note: If you choose to turn a card face-down that is being copied by a special order card, the special order continues to be considered as the card it is copying. (Remember which type of card the special order is copying). Tea clears the palate after eating a big meal. End of the round: Count the number of cards in your largest (or tied for largest) set of cards with the same background color. Tea is worth 1 point per card in that set. Example: Chris has 1 wasabi, 1 squid nigiri and 2 salmon nigiri. These 4 yellow cards are his largest set. His tea is therefore worth 4 points. Dipping a nigiri in some wasabi makes it extra hot! When you play a wasabi card, it has no effect. However, the next nigiri card that you play must be placed on top of the wasabi card. This means that the nigiri will be worth triple points at the end of the round! You may only place 1 nigiri on top of each wasabi. You may play multiple wasabi cards in one round, though a wasabi without any nigiri on it at the end of the round is worth 0 points. A heaping bowl of ice cream is always satisfying after you eat. At the end of the game, 1, 2 or 3 green tea ice cream are worth 0. If you have 4 green tea ice cream cards you score 12 points. A player may score multiple sets of green tea ice cream. Pudding is the perfect end to a meal - make sure you don't miss it! At the end of the game, players compare how many pudding cards they have. The player with the most scores 6 points. The player with the fewest (including 0) loses 6 points. If multiple players tie for most or fewest, all tied players gain or lose the full points. In a 2 player game: The player with the fewest pudding does not lose any points. Example: Chris has 4 pudding cards, Meredith has 2, and Kerry and Andrew have 1. Chris scores 6 points. Kerry and Andrew both lose 6 points. A selection of different fruit is a healthy way to finish your meal. Example: Chris has 0 watermelon, 1 orange and 4 pineapple icons. He loses 2 points for the watermelon, scores 0 for the orange and scores 6 for the pineapple, for a total of 4 points. Meredith played 0 fruit cards and so loses 6 points.